Suzuki has revealed its new Baleno hatchback in Frankfurt. Featuring a 'low, wide and sporty yet elegant profile' complemented by a wide bumper, grille, wraparound windows with blacked-out A-pillars, the Baleno also has a forward-sloping rear hatch suggesting the 'moving forward of dynamic energy'. A pair of 'high intensity discharge' projector headlamps - with a black and chrome design - emanates virility and sharpness, and LED position lamps double up as daytime running lights. A thin roof-spoiler integrated into the flowing body lines help improve aerodynamic performance says the Japanese brand. 16-inch alloy wheels or 15-inch steel wheels have a mechanical design to contrast with the flowing design of the body. A new, lighter Suzuki platform was developed for the Baleno, with the hatchback also featuring new technologies for better driving performance and better fuel efficiency. The 1-litre BOOSTERJET is a newly developed direct-injection turbo engine that achieves both 'good fuel economy and driving pleasure', made possible by using a small displacement, high torque turbocharger. By controlling the wastegate valve, which closes to create higher boost pressure during heavy-load operation and remains opened during normal driving, the BOOSTERJET reduces pumping loss, achieving high levels of both power performance and also fuel-efficiency and has a maximum output of 82kW and a maximum torque of 170Nm. The SHVS (Smart Hybrid Vehicle by Suzuki) is a mild hybrid system that uses an ISG (Integrated Starter Generator) to assist the engine during acceleration and also using the electricity stored through regenerative braking. The electric motor function of the ISG improves fuel efficiency by partially assisting the engine, which it does by making up for the additional added portion of fuel usually required during the high-fuel-consuming actions of starting from a stop and accelerating. It also allows for a smooth and quiet restart after an automatic engine stop, thanks to the use of an ISG belt-drive start, rather than restart by a conventional starter motor. Furthermore, the SHVS uses a compact, high-charging-performance lithium ion battery, making possible frequent engine assists. 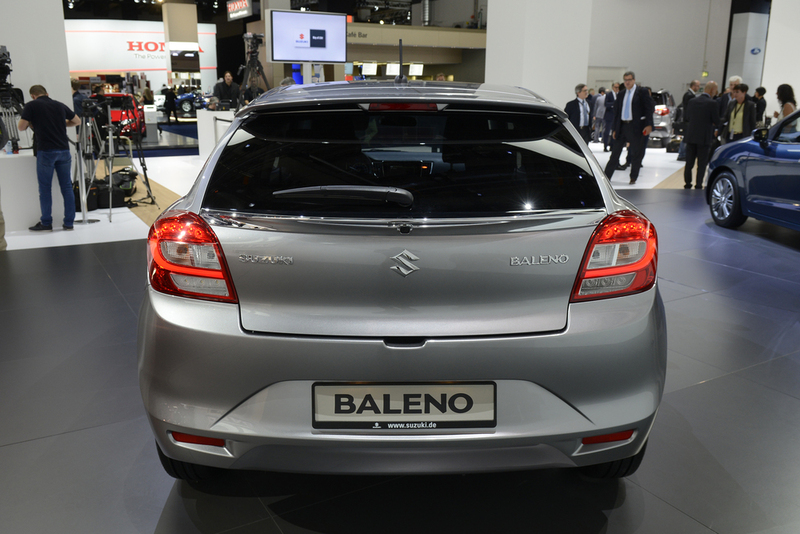 In the Baleno, the system aims to lessen the footprint on the environment with a CO2 emissions target of 93g/km. On the inside, a large high-definition colour LCD display in the instrument cluster shows performance and other information through user-friendly graphics. Highlighted features include driving G-force, engine output and torque, accelerator/brake operation, and energy flow. A Smartphone Linkage Audio Display with a 7-inch touch panel screen has a USB port and SD card slot and displays the view behind the vehicle by way of a rear view camera. It can be connected to an iPhone via a USB cable for using Apple CarPlay's various functions and can also be connected to smartphones using MirrorLink. Suzuki says the luggage space of 355 litres is the largest among B-segment hatchbacks. To accommodate long or wide items, the shape of the suspension has been optimised to free up space on both sides at the back of the boot. The luggage space can be enlarged by folding down the rear seatbacks, sliding the front seats forward, and using the luggage board in either its upper or lower position. The Baleno chief engineer Kunihiko Ito explains: "We set our sights on developing the ideal hatchback, one that makes no compromises, giving it an elegant, sophisticated and grown-up character. The Baleno perfectly embodies all the elements expected in a car of this size-design, utility, comfort, manoeuvrability, superior driving performance, and fuel efficiency." 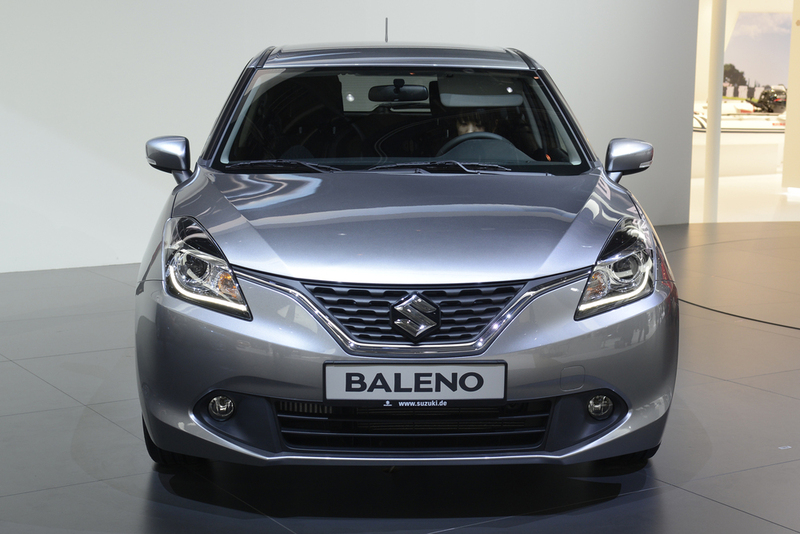 Sales of the Suzuki Baleno will start in Europe in the spring of 2016.